Graphically Gorgeous Board Books - Mamanista! Shouldn’t picture books have a little more visual pizazz? After all, they are all about the graphics. Duo Press Books agrees, and has created a trio of vibrantly jazzy board books. We love the hip and bright pop art graphics. Lichtenstein would approve. Two of the books count by numbers. For a born and bred New Yorker, 123 New York is a great choice. Or count your way through national symbols and pastimes with 123 USA. At the back of the counting books you’ll find each object described in English and Spanish. Toddlers will also go gaga over Sounds Funny!–a bouncy book of sounds that are terrifically fun to make. Each book suggests a world of excitement to tots, without being overly prescriptive. You’ll enjoy talking about the colors, sounds, and shapes with your child with this contemporary and spirited take on classic picture books. 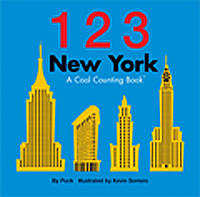 WANT IT: You can buy 123 New York: A Cool Counting Book ($7.95), 123 USA: A Cool Counting Book ($7.95) and Sounds Funny! A Book About Comic Sounds ($6.95) at Amazon and eligible for the 4-for-3 deal. Click HERE to look inside 123 New York, or inside 123 USA, or inside Sounds Funny! Leave us a comment by 8pm EST on May 19, telling us which book you want if you win AND which page is your favorite.